Athletic footwear and apparel giant Nike Inc. (NKE - Get Report) slipped below my annual pivot at $71.72 on the eve of reporting earnings after the closing bell Thursday, Dec. 20. The stock closed Wednesday at $68.97, up 10.3% year to date, but recent weakness has the stock nearly in bear market territory -- 19.8% below its all-time intraday high of $86.04 set on Sept. 21. This is a tough backdrop ahead of reporting earnings. Analysts expect Nike to earn 45 cents to 50 cents a share in its fiscal second quarter with most on Wall Street looking for positive demand for the company's iconic brands of athletic shoes and apparel. Most are positive about brand innovations in North America and China on solid margins and global economic strength. The uncertainties include sales in foreign currencies and a drag from the tariff situation. Nike almost always beats earnings-per-share estimates but not with consistent gains post-report. The daily and weekly charts suggest that Wall Street optimism of price targets up to $100 seem unachievable. A wild card is whether the controversial signing of quarterback Colin Kaepernick as the face of their "Just Do It" campaign is paying off or not. The daily chart for Nike shows that the stock had a price gap higher on June 29, following a positive reaction to earnings. This led to the all-time intraday high of $86.04 set on Sept. 21. At the high the stock was above my semiannual pivot of $83.79 which failed to hold when the market peaked on Oct. 2. This is the horizontal line at the top of the chart. On Oct. 10, the stock failed to hold its quarterly pivot of $79.69 which is the second horizontal line. This led to a decline to my annual pivot at $71.72, which is the third horizontal line which has been a magnet between Oct. 26 and Dec. 19. 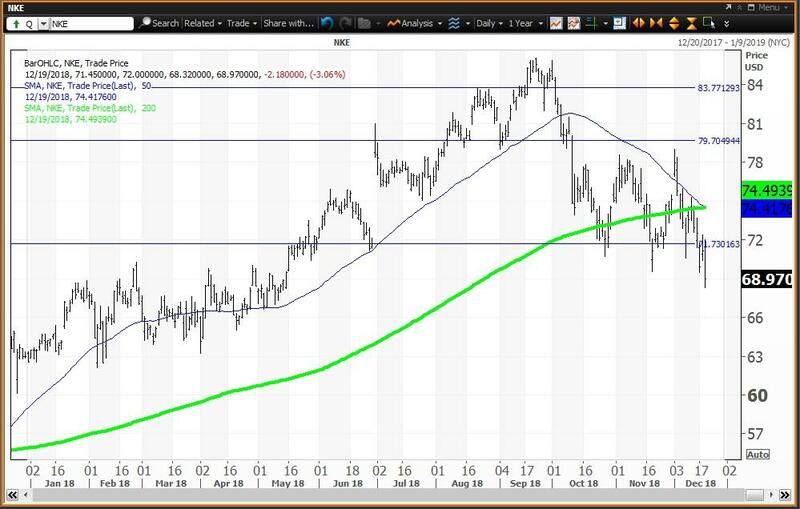 This sideways action puts the stock on the cusp of a "death cross" with the 50-day simple moving average at $74.42 crossing below the 200-day simple moving average at $74.49. If a positive reaction to earnings doesn't prompt strength above this cross the downside risk is enhanced. The weekly chart for Nike is negative with the stock below its five-week modified moving average of $73.50 and is well above its 200-week simple moving average of $60.40, which is the "reversion to the mean" last tested as a buying opportunity during the week of Oct. 20, 2017, when the average was $51.46. The 12x3x3 weekly slow stochastic reading is projected to slip to 22.26 this week down from 25.85 on Dec. 14. Given these charts and analysis, investors should buy Nike on weakness to the 200-week SMA at $60.49 or on a weekly close above my annual pivot of $71.72. 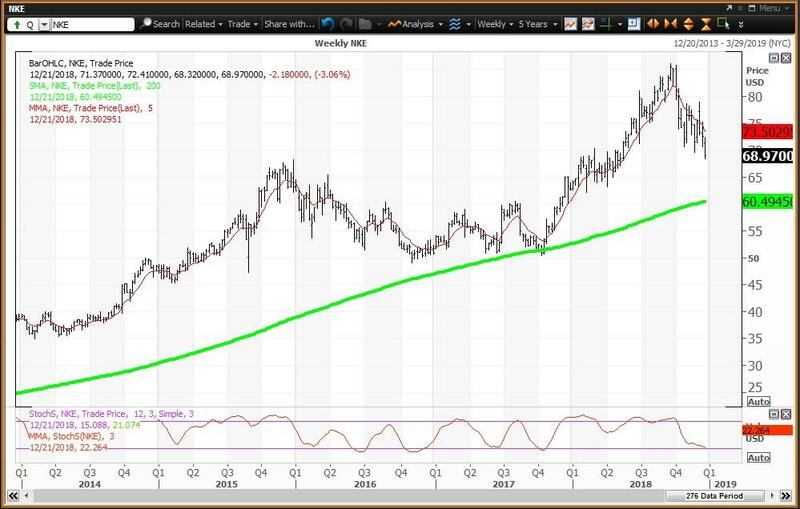 Reduce holdings on strength to the 200-day SMA at $74.49.